Home Ravindra Jadeja Ravindra Jadeja becomes 1st Indian left-arm spinner to pick 150 ODI wickets. Ravindra Jadeja becomes 1st Indian left-arm spinner to pick 150 ODI wickets. The Indian spinner later dismissed Jason Roy, making a total of 151 ODI wickets so far. 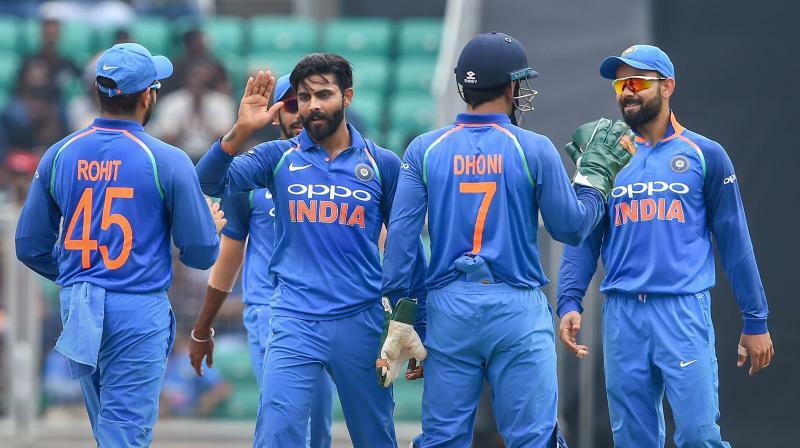 Ravindra Jadeja’s newly achieved record also makes him the 12th Indian bowler, and 68th overall, to have 150 or more wickets to his name in ODIs. Jadeja has a total of 111 wickets to his name in Test match cricket and 31 in T20Is. Comebacks are nothing new for Jadeja, but this one was clearly sweeter, because he was almost flushed into oblivion. Forget the emergence of Kuldeep Yadav and Yuzvendra Chahal, what would have hurt him deeper was the recalling of Axar Patel, once considered a cheaper counterfeit of him. In fact, it was Patel’s injury that necessitated his comeback. I hadn’t given up my comeback bid and I was always prepared, but I was a little surprised when the call came. Fatherhood and horse-tending did alleviate his hurt, but he was clearly restless at the lack of game time. This was also around the time India had begun their string of overseas tours, where Ravichandran Ashwin was preferred over him. Subsequently, he played only one of India’s 8 Test matches in South Africa and England. But in fairness, his ODI trade had taken a beating ironic for someone who was pigeonholed as a short-form specialist, before he became a regular Test player. The year he was omitted, he averaged a paltry 60.12, the year before he hit rock bottom, buying wickets at 85.66 runs apiece. There were signs as early as 2016, in which he bargained his wicket at a shade under 50. He was bleeding runs as well he was clouted for 67 runs in 8 overs in the Champions Trophy final.